If you’d ask me to do this a few years ago I’d say you’re out of your damn mind but it seems a lot’s changed since then. Now is my time to take a new leap of faith. The more I learn from the amazing people who have influenced my outlook on life the less I focus on money and the more I focus on being present, creating memorable experiences and building authentic human connections. One of the most powerful ways I’ve found to achieve these elements is to completely let go of all that is known and to step into the shadows of the unknown. When I remove my friend’s circle, family circle, access to the internet, knowledge of the land, shelter, running water, cupboards full of food and knowledge of what tomorrow will bring i’m slammed into the present moment where each step and breathe I take is a refreshing new one. What am I going to do? 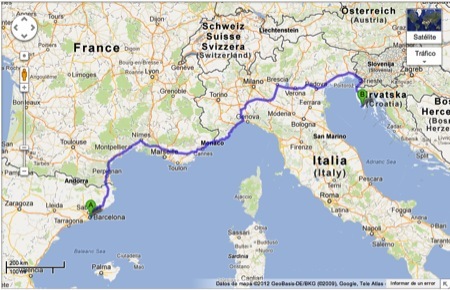 I’m hitchhiking from Barcelona to Croatia in a business suit. Why Croatia? I’m volunteering for an electronic music festival in an abandoned castle on the coast. Boat parties during the day and ruin raves at night. People and artists from all over the world come for 5 days of bassline madness. Why in a business suit? Well I want to put the suited man stereotype to the test…will more people pull over and offer a ride if I’m wearing a business suit? There’s only one way to find out. What ever happens I will find positives, learn and be a stronger person for it. I’m doing this as a lifetime message to myself that says, I am not afraid of the unknown; I conquer the unknown and become friends with it. I test it, I try it, I taste it. Wish me luck and I’ll see you on the otherside!